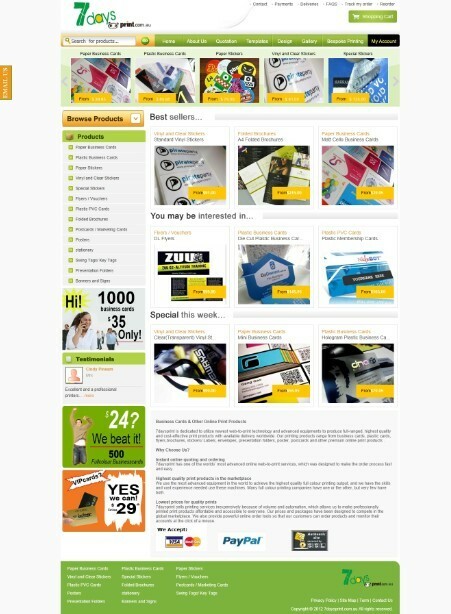 7daysprint is an Australia based online printing company. 7daysprint is also one of the world‘s foremost Internet-based printing company. We dedicated to utilize newest web-to-print technology and advanced equipment to produce full-ranged, highest quality and cost-effective printing products. Our aim is to impress you with the quality of our work, so when you show this work to your customers, your customer is impressed with you. By providing your customer with a professional image of you and your company, it will ensure that they will come back to you, and you are happy to come back to us. We feel that there is no need to pay more for quality, or to sacrifice quality for cost, when at 7daysprint, we serve both the domestic and international markets with first class products at competitive prices.